The Smithsonian’s National Air and Space Museum on the National Mall in Washington, D.C. is already a not-to-be-missed destination, attracting 6.8 million visitors from around the world last year. Now, through October 22, a special treat is in store for visitors: a rarely seen, five-centuries-old notebook written and illustrated by Leonardo da Vinci that demonstrates his absolute fascination with flight. 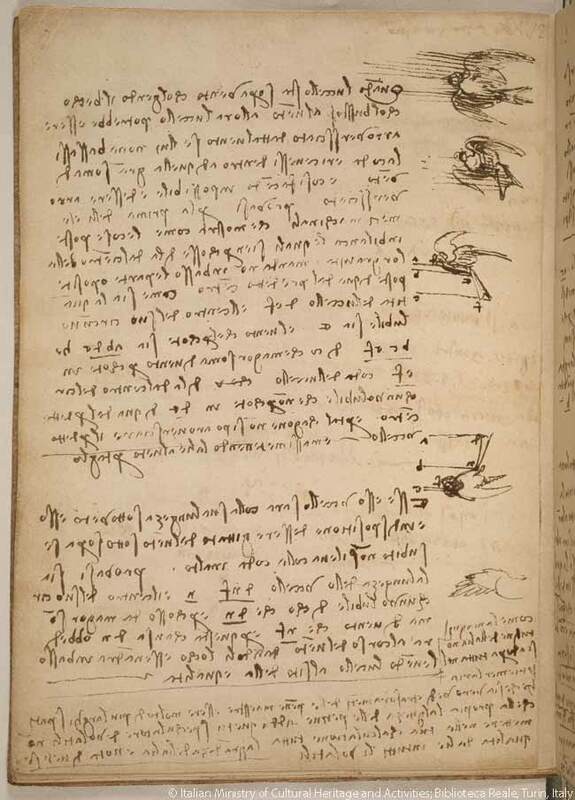 The notebook highlights da Vinci’s powers of observation, artistic capabilities, extensive familiarity with science, mathematics, engineering, and his forward-looking visions of manned flight – an achievement that would only come to fruition nearly 400 years later. 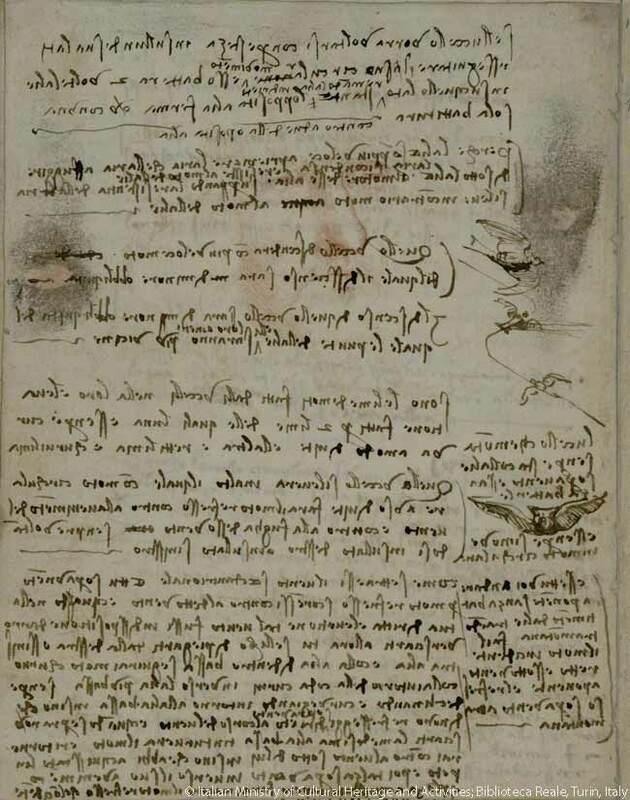 Da Vinci’s ‘Codex on the Flight of Birds’, dating from 1505-1506, is an eight-by-six-inch personal notebook made up of 18 two-sided folios in which he recorded detailed observations of different types of birds in flight – in his famous “mirror” script, written backward and reading from right to left – and made sketches of them. In his words and drawings, da Vinci explored far-reaching aeronautical concepts, including mechanical wings; flight-testing apparatus that could be used to understand aerodynamics; the importance of lightweight structure; how the pilot’s position in a flying machine could be used for balance, and safety mechanisms for pilots such as an early-concept airbag (filled with water) and parachutes. And the notebook was being written, Jakab adds, during the same period as da Vinci was painting his masterpiece the ‘Mona Lisa’. The notebook is displayed in a specially designed and secured case located, appropriately, in the exhibition space, ‘The Wright Brothers & The Invention of the Aerial Age,’ whose centerpiece is Orville and Wilbur Wright’s 1903 Flyer, the world’s first successful powered aircraft. 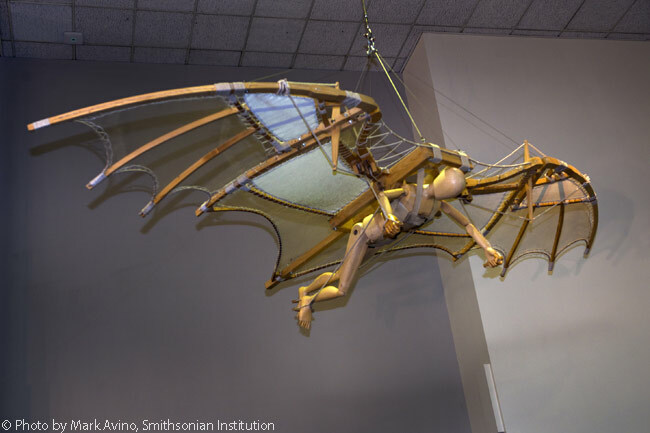 Hanging at the entrance to the gallery is a full-size model of an ornithopter, a human-operated, wing-flapping flying machine envisioned by da Vinci. The model, from a drawing in a folio owned by the Institut de France in Paris, was lent to the museum by Italian aerospace company Finmeccanica for at least a year. Although only two pages of the fragile codex are on view in the dimly lit, climate-controlled display case, larger copies of the original pages, along with an English translation, are on view on nearby digital monitors. Visitors can flip through the pages to read da Vinci’s text and look at his drawings, glimpsing his fertile mind. At a press preview of the exhibit, Italian Ambassador to the U.S. Claudio Bisogniero said it is a highlight of ‘2013 – Year of Italian Culture in the United States’, a three-month program of more than 300 events in 50 U.S. cities showcasing Italian creativity and innovation. Because the codex was da Vinci’s personal notebook, visitors leafing through the pages finds it contains other notes unrelated to birds and his obsession with flying and flying machines: an ostensible shopping list (including chicken, for two soldi), a payment (“… 25 florins from the chamberlain of Santa Maria Nova”) and a visit on a Tuesday evening in April, 1505, by Lorenzo. “He said he was 17 years old,” da Vinci comments, as if questioning his veracity. 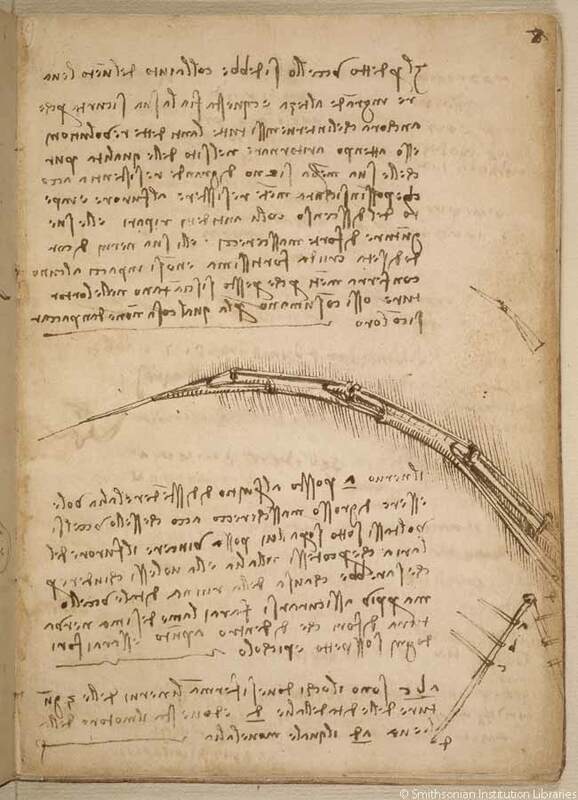 My personal favorite musing in a margin: “In summer, you can bring snow to warm places by collecting it from the high peaks of the mountains, and letting it fall on the streets during the summer festivals,” da Vinci suggested. Leafing through the pages, it turns out da Vinci was a recycler. On one page, on which he discusses how birds manipulate their wings to sustain gliding flight, a self-portrait in red is visible beneath his writing. 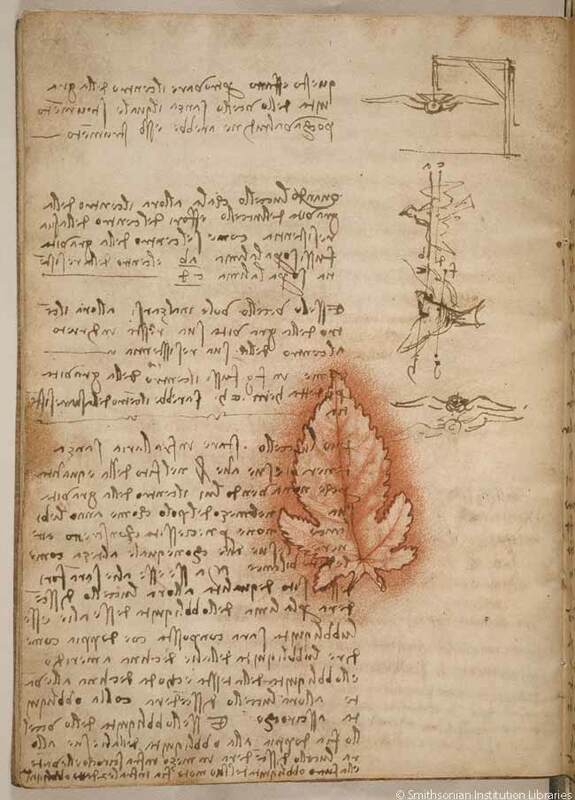 On another page describing the use of flight-testing apparatus, an outline of a leaf previously drawn on the page indicates Leonardo reused the sheet of paper. Born out-of-wedlock in 1452 in the village of Vinci, Leonardo was consequently known simply as Leonardo da Vinci, Leonardo of Vinci. Raised primarily by his grandparents and an uncle, Leonardo was apprenticed at age 14 to the Florence workshop of Andrea del Verrocchio, described by Jakab as “something of a one-man university of the arts”. The limited-run exhibit was organized by the Air and Space Museum, the Ministry of Italian Cultural Heritage and Activities, the Italian Embassy in Washington, and the Biblioteca Reale in Turin in Italy. The Biblioteca Reale (Royal Library) has had possession of the codex, now kept in a vault, since 1893, when all its pages were reunited after having been dispersed around Europe and Russia. It has left Italy only three times in 120 years. From Washington, D.C., the ‘Codex on the Flight of Birds’ will move to the Morgan Library & Museum in New York, where it will be on view from October 25 through February 2, 2014. The exhibit is accompanied by an eight-minute video by Italian journalist Silvia Rosa-Brusin, who traces the history of the Codex and also explains how Leonardo da Vinci was “the first man on Mars”. According to Charles Elachi, director of California’s Jet Propulsion Laboratory, the notebook and Leonardo’s self-portrait were digitally scanned, put on a chip and placed on the Curiosity rover that was launched to Mars in August 2012. “So we can truly say Leonardo is on Mars,” Elachi said at the press preview. Carole Shifrin has been a Washington-based freelance writer for ten years. Her career includes 15 years at Aviation Week & Space Technology, where she served as Dallas Bureau Chief, London Bureau Chief and Senior Transport Editor, and 13 years as a staff writer at The Washington Post. Carole is the recipient of numerous awards, including the prestigious Lauren D. Lyman Award for distinguished, career-long achievement in aviation journalism.